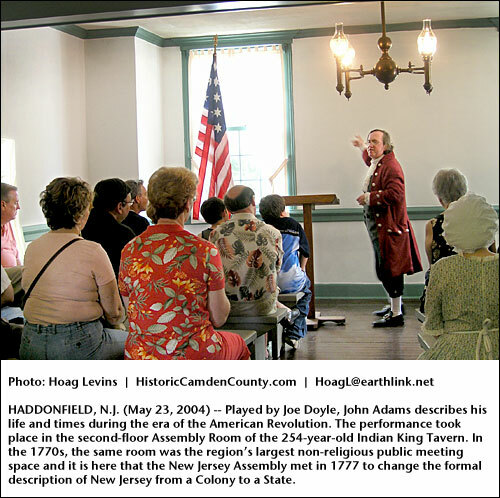 HADDONFIELD, N.J. -- If there was any underlying message in Joe Doyle's performance as John Adams at the Indian Tavern Museum on May 22, it was this: the more things change in America, the more they stay the same. 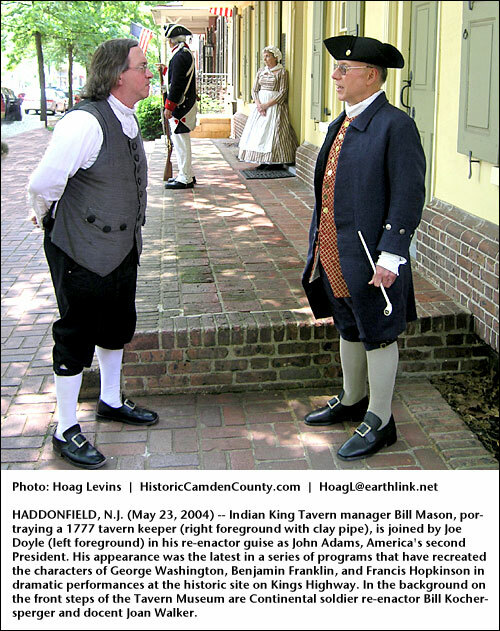 Actor and director Joe Doyle portrays John Adams in a performance at the Indian King Tavern Museum. See larger photo. 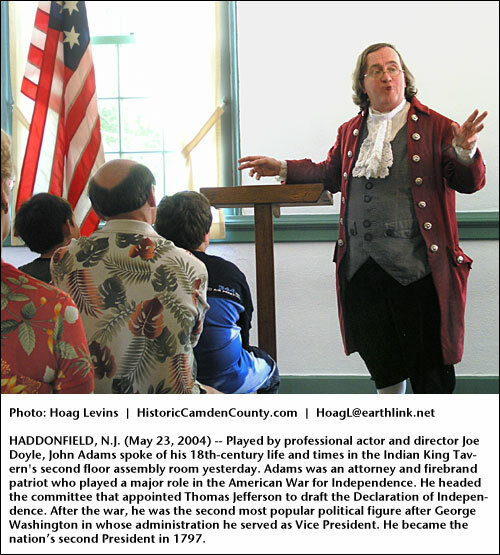 Doyle, an actor and director who portrays the country's second President for the American Historical Theater of Philadelphia, spoke in character as a leading historical figure of the 18th century. But it was clear he also appreciated how history can provide context for events in our own century. The 55-year-old thespian spent the afternoon at the state historic site here to recreate the life and times of the man who was the first Vice President as well as the first U.S. President elected in a contested election (he narrowly beat Thomas Jefferson). A signer of the Declaration of Independence, Adams was a controversial political figure who played a major role in both fomenting the Revolution as well as hammering out the structure of our current democracy. For instance, he was a firebrand attorney who drew widespread public wrath when he agreed to represent the British soldiers who took part in the infamous 1770 "Boston Massacre" that helped set the stage for the outbreak of the Revolutionary War. After emotions cooled, however, history viewed Adams' stand as a courageous one underscoring a key principle of what became the American system of justice: That even incarcerated British soldiers charged with killing Colonists had the right to fair and reasonable treatment before the courts. 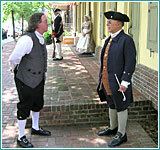 Indian King Tavern manager Bill Mason (right foreground with clay pipe) is joined on the front steps of the museum by Joe Doyle, John Adams re-enactor. In the background are Continental soldier re-enactor Bill Kochersperger and docent Joan Walker. See larger photo. told the Indian King audience in Adams' words. "It gave proof that we could be a nation of law." In comments after the performance, Doyle pointed out that his audiences are often surprised to learn how similar the issues and political debates of Adams' time are to those of our own era. For instance, today's arguments about the Bush Administration's Patriot Act, he said, are amazingly similar to the heated arguments that Adams and rival Thomas Jefferson waged over the Alien and Sedition Acts of 1798. Those 18th-century internal security laws came into being as the country prepared for a possible war with France at the time Adams was elected the nation's second President in 1797. Doyle runs the Actors' Net of Bucks County at the Heritage Center in Morrisville, Pa., and has been playing the "Official" John Adams for five years. He appears in the role at the White House Visitor's Center, the National Archives and other national historical functions around the country. He points out that actors selected as American Historical Theater interpreters of famous historical figures must immerse themselves in research to understand the character as much a possible; even thinking and speaking as the charcter might have if presented with a modern situation. Mr. Doyle's John Adams performance took place in the second-floor Assembly Room of the 254-year-old Indian King Tavern. In the 1770s, the same room was the region's largest non-religious public meeting space. See larger photo. has such a demand for programming that all these niche channels focusing on history have developed," he said. "Viewers are stumbling across programs on the History Channel and other similar channels and being exposed to historical drama and documentaries which they find very interesting. It engages them and opens them up to the subject." "Combined with that," he continued, "current events are calling history into fuller play in peoples' minds. When commentators have looked for a comparison to the Patriot Act debate, they have found it in the Alien and Sedition Acts. So you have this very obscure historical subject suddenly appearing in the news. The historical interpreter has to do his homework so he can explain such things to audiences whose members inevitably ask questions." "For many, it's hard to realize what it was like back in the 18th century as democracy was first beginning," he said of the Alien and Sedition Acts. "The participants were saying, 'Yes, we want free speech but with some reasonable restraints'." Overall, those early internal security laws sought to rein in the excesses of the press as well as limit the freedoms of non-citizens in the new country." "Obviously, the administration in Washington today uses a similar argument for the Patriot Act -- and other things that opposing groups see as an impingement on rights -- as a reasonable response needed to protect the public," he said. "What it demonstrates is that the debate has been going on for a very long time and never changes -- just the names of the people doing the debating change." Doyle's was the latest in a series of programs that have turned the 254-year-old Indian King Tavern into a stage for re-enactors portraying key historical figures from the late 18th century when the Tavern was a major social and political crossroads of the region. Aside from yesterday's John Adams day, the museum has presented George Washington played by William Sommerfield, Benjamin Franklin played by Dean Bennet, and Francis Hopkinson, who designed the Great Seal of New Jersey that was adopted by a meeting of the State Assembly in the Indian King in 1777, played by Christian Johnson. All are part of the American Historical Theater of Philadelphia's historical drama program.